In spring 2012, ﬁfth-grade students at Parkway Elementary School in Virginia Beach achieved an unprecedented level of success on the reading portion of their Virginia Standards of Learning test: 100 percent received passing grades. To put this achievement into perspective, just under 80 percent passed the previous year. What changed at Parkway to make such a leap possible? Principal Nanocie “Toni” Diggs gave credit to the school’s widespread implementation of Junior Great Books in 2011-2012. “Absolutely,” she said. “I do give a lot of credit to Junior Great Books for our success last year.” Diggs noted that the use of Junior Great Books has changed the learning and teaching culture at Parkway. Where students once would have given “yes” or “no” answers, they now dig into texts to give reasons for the answers they provide. "The students can’t just give a ‘yes’ or ‘no’ response anymore . . . There has to be a ‘because,’ ” said Lisa Marler, a second-grade teacher at Parkway. Diggs also noted that this habit of probing more deeply for answers ﬁts well with general problem solving and critical thinkingtwenty-ﬁrst century skills that students need to develop. Junior Great Books has been used throughout the nation since it was ﬁrst developed in 1962. The program is no stranger to Virginia Beach School District, having been used as a gifted resource for many years. Junior Great Books is well known for its outstanding literature and its unique method of learning, Shared Inquirya Socratic discussion method in which teachers ask students questions about a text that are central to the text’s meaning, and that have more than one defensible answer. After years of its use in gifted classrooms, however, reading specialist Grier Crosby proved that Junior Great Books could be valuable to other students as well when she teamed with the teacher of a ﬁfth-grade inclusion class to bring the program to special-needs and regular-ability students. According to Diggs, “special-needs students who never passed a state assessment” passed in reading because of their involvement with Junior Great Books. “Their conﬁdence rose, and these students were able to perform better in other subject areas because of the ‘I can do it’ attitude they developed,” she said. Teachers at Parkway have discovered many beneﬁts of the Junior Great Books program. Fifth-grade teacher Kimberly Alvers lauded the program because it “gives the quiet ones a voice.” Teachers qualify to implement Junior Great Books by taking the Foundation's core professional learning course which gives them a solid grounding in the Shared Inquiry method of learning. One thing they learn is how to help children who are normally reserved feel safe venturing their own opinions about the story everyone in the class has read. Over time, as the ﬁfth-grade girl observed, students soon become involved in a conversation with each other, not just a question-and-answer session with the teacher. Alvers also noted that Junior Great Books’ interpretive activities address the needs of different types of learners. “For example, the diverse writing prompts give students different approaches to express their opinions,” she said. Students are given the chance to practice expository and creative writing as they complete a Junior Great Books unit, and they are introduced to a variety of writing concepts and structures, including paragraphs, essays, letters, poems, and stories. Junior Great Books can even “give teachers a bit of a help in coping with their busy schedules,” Marler said. Alvers added, “The lesson plans are already there . . . All the techniques that we need to address—main idea, problem solving, critical thinking—are techniques already covered in the program’s lesson plans.” Indeed, every Junior Great Books unit includes detailed instructions for carrying out prereading, note-taking, vocabulary, discussion, and writing activities, as well as curriculum connections to other subjects. 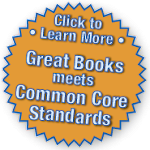 Teachers can also continue to hone their Great Books skills as they implement the program. Kriko Michaels, a staff trainer for the Great Books Foundation, has been helping Parkway teachers master Shared Inquiry discussion and the directed note activity since they began their implementation. As Diggs put it, teachers “need praises and polishing, just as students do.” Michaels has been on hand to meet with teachers, model exemplary Shared Inquiry skills, and team-teach with Parkway faculty. “Kriko has a passion for the program, and it is evident in how he trains our teachers,” said Mackenzie Robinson, another ﬁfth-grade teacher at Parkway. It seems clear that Junior Great Books will be a ﬁxture at Parkway Elementary School. Principal Diggs noted that this year at “literacy night,” dedicated to literacy practices in the classroom, teachers were given a choice of what to present to parents who attended. “Fifth-, fourth-, and third-grade teachers all chose to discuss and model several components of Junior Great Books,” she said. Teachers were happy to tell parents about the program that has served them and their students so well.